Repose Gray by Sherwin Williams is the perfect warm gray that you’ve been looking for. It will work in any room in your home, guaranteed! You’ve previously seen me mention that we painted our kitchen Repose Gray by Sherwin Williams. I’m not exaggerating when I tell you it took me 12 other shades of gray before I found the right one. Scroll through to get all the details including pictures of Repose Gray in my home and in other beautiful spaces! The problem with our kitchen is that it’s all white and gets extremely cool light. So while Benjamin Moore’s Stonington Gray or Gray Owl (which I’ve written about before) would have been my first choice and perfect in every single other room in the house, in the kitchen they felt stark, cold and frankly, very blue. I knew I needed a gray with a hint of beige. Not too much that it became muddy looking or actually beige, just a teeniest little bit to warm it up. I guess technically Repose Gray is a “greige” but all the other so called greiges I tried had much stronger brown undertones, and this is still firmly on the gray side of life for me. The picture above was taken right inside my front door. While the light is much warmer here than in the kitchen, Repose Gray still just has that touch of warmth to it. 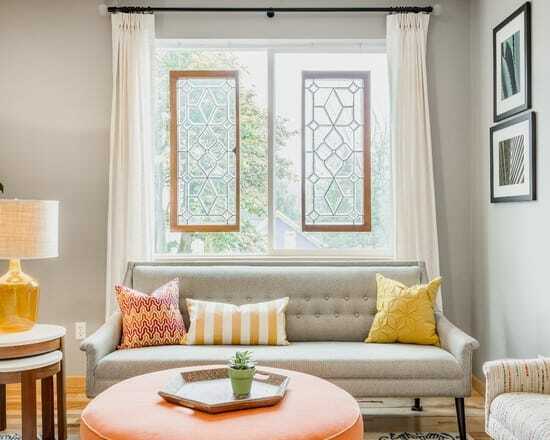 It’s really the perfect undertone for a gray that you will want to use throughout your home because regardless of the light of light, it will work. Paired with crisp white trim, it gives a really fresh modern feel to any room. I think one of the colors that goes really well with Repose Gray is this lovely gray-toned blue (Serious Gray by Sherwin Williams). Something about the gray-blue tone really complements it so well! (read more about my favorite blue-gray paint colors here). If you want to minimize the beige undertone for a cleaner gray, I would stick to keeping Repose Gray in bright spaces as the beige really comes out in darker spaces. Not that I don’t like that, I actually really love how this gray never feels cold. I want to share with you some other spaces that have used this wonderful color. If you have cooler light or a north facing room and cannot find the right gray, definitely try Repose Gray. Recently, I’ve had a lot of readers tell me that in their homes, Repose Gray looks blue. While in the majority of spaces this won’t happen, if you have cold northern light it may look blue or green at certain times of the day. I recommend using a very large swatch of the color before committing to ANY paint color to ensure that it works in your particular lighting situation. Have I persuaded you to choose Repose Gray for an upcoming paint job? Or have you already used it in your home? If you think Repose Gray is too light for you, read about Mindful Gray which is a shade darker. If you’re looking for an even lighter gray that has just a hint of warmth like Repose Gray, then Paper White is also a great choice! What wood are your floors? do you know what type/color? HI. I love your blogs. I painted my living room and dining room Stonington Gray. It looks blue at certain times of the day. I want to do an accent wall one or two shade darker than the Stonington. Do you have any advice on which gray I should pick? Stonington definitely has a blue undertone! I can’t remember that the next darkest shade is, but if you a color card from the BM store (or just google it) it will tell you what the next darkest color up is. I am considering using Repose Grey in our living room, which is a North facing room with a picture window. I am curious to know what color furniture you choose.? My living room has a orange brick fireplace that I am working around and I am not planning to whitewash it. So like you I have a ton of painted swatches on my walls, Right now I have Colonnade Gray. Modern Gray & I am thinking of getting another sample can of Repose Gray. Some walls look Beige/Taupe & others look dark Gray! I do not want beige or Taupe as I have had this colour before! I also don’t want the Blue or Green undertone. I have already spend over 100 on paint samples and am so frustrated!! Hi, if we paint our whole house walls Repose gray, bm decorators white for trim, what color should we use for ceilings? I always just use regular off-the-shelf flat white ceiling paint! Love your home. What color is your front door? Hi Jenna, your blog is fabulous! Would you mind sharing what type of hardwood flooring/stain (+ staircase) you have in your foyer which was painted repose gray? I have a very similar entry way in the house I just purchased and am painting the interior repose gray. I’m replacing all carpeting with solid hardwood flooring. I’m currently torn between Mirage’s natural red oak versus their natural white oak. I would like to preserve the oak finishes currently in the home and like that you didn’t paint the staircase. I think either would work but would love your input. Thanks! Hi Laurel! Our floors are white oak stained with Bona Provincial Stain (water popped) and finished with satin poly. Jenna, this blog is fabulous! Would you mind sharing what type of hardwood you have in your main foyer (flooring + staircase) which was painted repose gray? I have a very similar entry way in the house we just purchased. I’m planning on painting the entire interior repose gray with white baseboards. I’m also replacing the carpeting throughout with solid hardwood. I’m currently torn between Mirage’s natural red oak or their natural white oak flooring. I would like to preserve the other oak finishes in the house including our staircase which is also oak – I love that you didn’t paint your stair bannister white or expresso which seems to be very on trend these days. Any recommendations? Thanks! Hi love your blog! I recently put repose gray on my walls and it looks totally blue! We have soft white lights and it even looks blue in natural light. I’m so confused… help! Hmmm that’s strange. Repose Gray does not have ANY sort of blue undertone, it technically has a bit of green to it. Did you definitely get the right color mixed? I got that too. I check it and it seems that your floor and light had lot to do. I have light tans hardwood floor and the grey color I chose does not have blue undertone but my floor color contrast made a big difference. I had seen dark wood floors with the same color and no blue reflection at all. Floors and light have 100% got to do with how the color looks. It’s just funny because I’ve seen Repose Gray with light hardwoods, beige carpet and darker hardwoods and I’ve never seen a blue undertone appear – green, yes – but not blue! But people have told me that Bm Stonington Gray has the tiniest blue undertone and in my kitchen it’s literally baby blue! That’s why getting samples and testing color is SO important before committing! I got a sample of Repose Gray from our local Lowe’s…and it def. has a blue undertone!? Perhaps go to an actual Sherwin Williams and have it mixed in their paint base?? Hi Lila – depending on your light situation it may me picking up on color outside (greenery) or northern light is bringing out a blue undertone. I’ve heard it so often lately (even though I’ve never personally seen it) it seems that the blue undertone is possible! I’ve heard a few people mention a blue undertone recently. I think Repose Gray may be slightly unpredictable in northern exposure rooms and at night. If it’s not working for you, there’s plenty of other amazing grays out there with different undertones! I live in a Victorian home. My kitchen is painted Mindful Gray & has white woodwork. Will Mindful Gray look right in my dining room which has oak woodwork? If not, what color gray would you suggest to coordinate with the kitchen? LOVE Repose gray and all your photos! Doing a laundry room makeover and wanted to use Repose but the tile backsplash is almost an exact match. Literally, it IS the same color so I cannot use it as the tile will blend in too much. Is there a “lighter” version of Repose to achieve the same look/color that will coordinate with, rather than, blend with the tile? Thanks for your help! Hi Jenna! I’m going nuts over here with a North/east facing room! I have a lighter grey sofa in the room already and am trying to find a grey that will suit going with it. Every time I put something Greige up, it looks muddy (have tried pale oak, winds breath, Edgecomb grey) and terrible behind the sofa. How does repose do next to other greys (fairly cool grey)? Would SW extra white trim and cabinets go well with Repose? I love bright white cabinets look, but don’t want it to be too stark, or have any yellow undertones.. as we’re also doing Carrara Marble in our Master. Please help! Is there a SW version of BM Decorator’s White? Or Behr? Hi Jack – you can get any color mixed up by any brand. If you prefer Sherwin Williams, just ask them to color match to Decorator’s White. They will pull up the color code on their computer and mix it in their own paint. Back in 2012 when we built our new home, we also our home painted repose grey. It’s been 5 years and I don’t regret it one bit. It’s still beautiful and like you we tried on like 20 different colors before picking this one. Do you have an exterior white trim that you would recommend to go with the exterior of repose grey? we will have black windows and white trim but looking for a good white trim. Hi Nancy – Repose Gray is BEAUTIFUL on cabinets! Which Light French Gray are you talking about? The Behr one is in fact blue and the SW one is actually very dark – you can see it in my mudroom here. I wouldn’t recommend it for cabinets. Another nice light gray (a good bit lighter than Repose) is BM’s Paper White. I hope that helps! Hi Jenna! I enjoyed your post. We are buying a new construction home & have to pick a single wall color (SW) for the whole house before it is built. I want gray, but the main room is north-facing and I don’t want the room to look dark. There is no way to sample colors in advance so I’m thinking Repose. Is there a SW warm gray you know of that brightens a room better than Repose? Does Repose go with SW Alabaster cabinets and SW Dovetail kitchen island do you think? Yikes – that’s a lot of pressure since you can’t even sample the color, first?! I have a lot of dark areas and very bright areas in my home and Repose Gray looks beautiful in both. It’s closer to gray when it’s bright and a bit more beigey when it’s darker but always beautiful. Both Alabaster and Dovetail are on the warmer side so I think it will all work together. Even if your builder told you it needs to be a SW paint – remember that you can color match any other brand, too. So for instance if you love BM Decorator’s White for trim you have have them get that color mixed up in SW paint. Hope that helps and good luck! HI Jenna, I just came across your blog today and I love this grey color. We are looking at painting our dinning room last room in the house to get a make over to say New floors which are dark wood. My question is how do you think this paint will look on walls with knock down on them( textured walls) we have sanded them down but it still has the textured look. Also we have added a closet in the room. Do you think the doors would look good also a darker color, I don’t want it to stand out. the room is 13×17 it leads into the kitchen. faces south but the only natural light we have is from the glass in the front door. 1 chandelier and led can lighting. 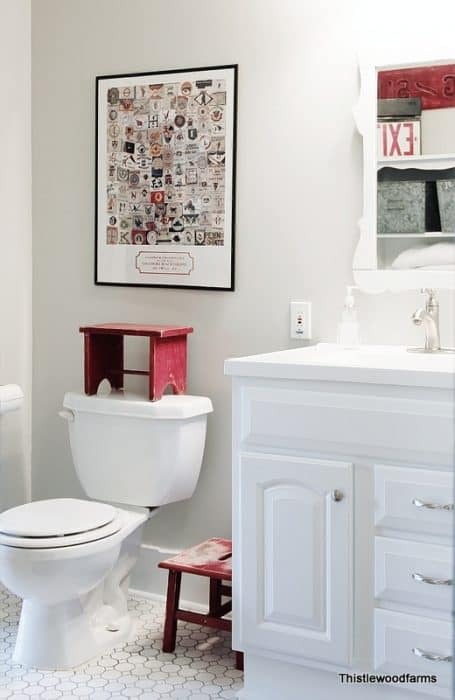 Whats your thoughts about this wonderful color and the textered walls. Thank you for taking the time. If you’re concerned about the texture, use either a low sheen paint (like an eggshell or even flat finish). I recommend painting your doors white because it contrasts beautifully with the repose gray. I hope that helps! Thank you!! Going ro get paint this weekend. Hi we are getting ready to paint our entire open concept ranch house. My kitchen cabinets are an off-white ivory color and they are driving me crazy! My counter has flecks of blue, gray, cream, white, silver and black. Trying to find a paint is next to impossible. I’ve tried every version of gray imaginable and I do like repose but it’s very, very light. I am thinking that I like mindful a little better but I’m worried about the green undertones… I hate green. Also, I want to pair the mindful gray with a dark blue color like SW Naval, just for some contrast in the dining room. Is Mindful going to work okay? We do like repose but it looks almost white on our walls in the lighting…. Hi. I’m in the same confusion as you. What did you end up picking? Mindful 25 % lighter or repose? Hi Alicia – the first few pictures are all my home with Repose Gray! Repose gray look good in this home or too dark? Would it pick up on the green back drop out the great room windows? Thank you!!! Can you suggest a lighter and darker gray that could be used with the Repose Gray? I’d like to paint my living room with the RP Gray, but have a staircase going to the second floor and the wall going up is open to the living room, so they’d have to work together. I’d like to paint it a slightly darker gray that the Repose Gray. I was also looking for a suggestion or 2 with regard to a lighter colour that would work well with RP Gray. Hi Sara! That’s a bit strange since it technically has a green undertone, and definitely can appear a bit beige. I’ve used it throughout my home in all different lighting situations and there’s certainly no blue in it at all. We didn’t use primer either, just two coats of paint but we were dealing with white walls to begin with. Also, we had it mixed in Benjamin Moore paint but I know several people who have used the SW formula with no issues. I’m sorry that it didn’t work out for you. Did you double check that your painter purchased the right color? My paint accidently purchased SW Light French Gray when I wanted Behr Light French Gray before and they are two totally different colors. If you do decide to change colors, I can’t emphasize how important sampling in different lights is. 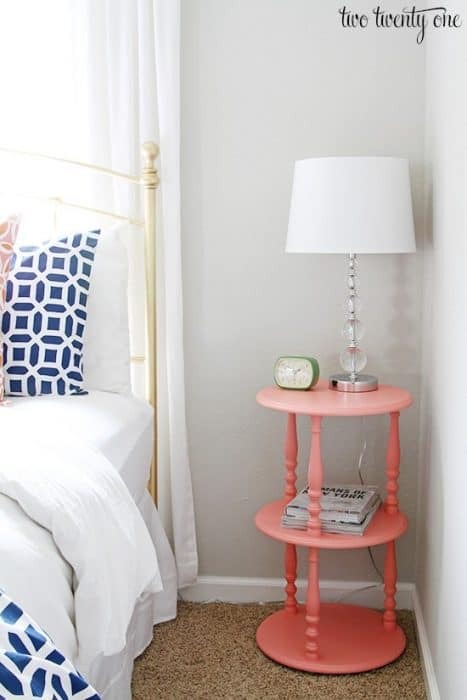 Get some foamboard and paint it and move it around your rooms so that you can see what the color looks like in different light (morning, afternoon, evening). Also, keep in mind that your furnishings and fixed finishes (cabinets, floors) could impact the undertone of the color. now I’m starting to wonder if it’s the lighting too…do you have mostly white light bulbs vs yellow light in your house? I know this is an older post, but I also had the same issue with my repose gray. I painted my hallway bathroom (no natural light) and it came out blueish gray at two coats. I did a third and it took on a less bluish tone but definitely not as warm as the pictures in this blog. Did you try a different color or stayed with the same repose gray? Hi Melissa, nope just Repose Gray. It’s so important that you test paint out before committing to it. Everyone’s lighting conditions are different and based on the furnishings and other factors, a color can pull out different undertones. Repose Gray technically has a slight green undertone so I’m surprised that it’s leaning blue but I’m sure whatever is in your space or outside your windows is somehow influencing it. You are so nice to respond to everyone! What gray would you suggest I paint 5 shaker panel doors with this color walls and white trim? Hi Linda! I personally love how this color looks with white trim and doors as it provides a beautiful crisp contrast. My favorite white is BM Decorator’s White. 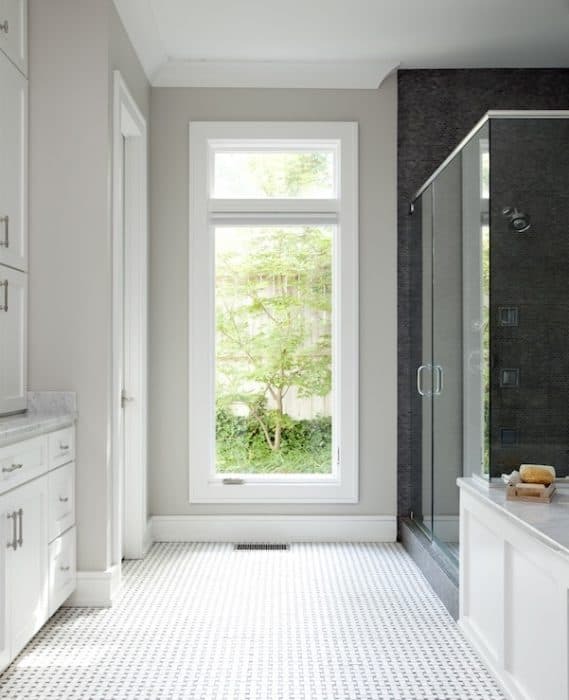 It’s hard for me to tell without seeing the space, but it sounds like it might be a little too “greige” pairing either repose or mindful gray with the slate color trim and greige floors. Mindful Gray has a pretty strong green undertone which might start making everything muddy….Repose Gray is a cleaner color with less of the undertone peeking through. Have you considered a cooler toned gray like Gray Owl or Stonington Gray? Just my two cents of course – but I would grab a bunch of sample posts and see what they look like at the very least! Forgot to add the name of the color, it is red bay. Would repose work as well or should I do quest grey or an all together different grey. Hi the pictures and design are just so pretty !! I am planning to paint my interior with SW repose gray too, I want to ask for recommendation on a matching white color for trim, ceiling and interior doors? I know you mentioned BM decorative white , do you have similar for SW? Thanks so much !!! Hi. I am planning to use repose gray on the exterior brick and wood of my house. I am using black fox on the shutters and doors. I was planning to use eider white, which is the next lightest shade, on my trim, but I am afraid it will not be a big enough contrast. Any advice? Thank you so much! Hi Jenna! I’m going GRAYzy over here!! I stumbled upon your blog while trying to find the right paint color for our new house. We have to choose one color for the whole home, which is a modest 1000 square feet, and north facing, so gets limited light exposure. Here is the clincher- we can’t test the paint out in advance because we currently live in another city. 😯 I would love a brightening neutral gray that will pair well with navy and soft shades of turquoise. I just want to find a foolproof color that will make our new home cozy, but not dingy or cold. Can a space be warm and airy?? Would love any feedback. I’m stuck. Been going around and around from Gray Owl, to Repose Gray, then Passive, & back to Gray Owl. No, Revere Pewter, lightened. No, none of those. Help, please! Hi Jodie! 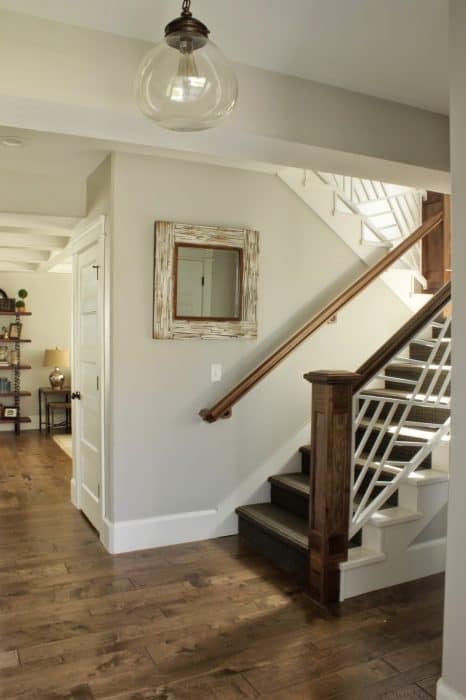 We used Repose Gray in our entire downstairs and upstairs landing and absolutely adore it. It’s the perfect warm gray. In cooler light, it adds the perfect warmth without looking muddy and in warmer light looks equally gorgeous. Paired with bright white trim, it’s really stunning. I can’t recommend it enough! Gray Owl can have some funky undertones, especially in northern light and is definitely a cooler gray. If you are going for warm and airy, Repose Gray is the way to go! Question: Would White Dove work well as a trim color with Repose Gray? What color should I choose for the ceilings? Hi Allison! I believe White Dove is on the creamier side of things…not really a bright white. I would recommend a crisper white like Simply White or Decorator’s White, personally. We’ve also used Decorator’s White on our ceilings as well as standard off-the-shelf white ceiling paint and they both look great! Thank you for your quick reply! Up until today, I was planning on Revere Pewter for most of our walls, White Dove for trim and all cabinets just to keep it simple (and less expensive!). Now, I’m thinking Repose Gray for almost all rooms, and I’ll go with one of your trim recommendations. Would you carry over this trim color to all cabinets, too? Thank you so much for your help. My head has been spinning! I forgot that SW have a “white dove” too…which is very similar to BM Decorator’s White. If that’s what you meant, then either one would be fab. Ben Moore’s white dove is cream…so don’t get confused between the two. BM Decorator’s White is great too because it has a tint of a creamy undertone that stops it from feeling too cold (similar to the SW white dove) A lot will depend on your light situation. We’ve used Decorator’s White on all our built-ins and trim and adore it. I have no idea what color our kitchen cabinets are painted because we didn’t do it. Hi, I’m thinking to paint my living room with repose gray but I’m looking for a different color for the dining room. Can you recommend a color that looks good with repose gray for a dining room. Also what color can I use for the trim. Thank you. Hi Johanny – do you have any type of color at all in mind? Gray, blue, etc? There’s A LOT of colors that would look great alongside Repose Gray. I can tell you that I’ve used Mindful Gray in dining room, which is a shade darker than Repose Gray but with a slightly stronger green undertone. Another beautiful (but pretty dark) color is Serious Gray by SW. It’s a dark gray with a lot of blue to it. Finally, a color like Light French Blue by Behr is a lovely gray/blue. Hi, Jenna. Your home is lovely! We have an east facing dining room with a vaulted ceiling and not much lighting. We’ve begun to decorate in an industrial/farmhouse style (if there is such a thing). I would like to use a deeper concrete-type gray on that tall wall, but just can’t decide whether to lean blue or warmer with the gray. I’d hate to be stuck with a too-blue color for the next 10 years until we can afford to hire a painter again :) And I don’t want it to cast a green tinge. Any thoughts? We are also painting the rest of the house and hope to try the Repose Gray, especially with our fieldstone fireplace. There is a tiny bit of eastern light, so it’s much darker in that room. Will we still see the gray tones or will it lean green with the warmer lighting we have? Repose Gray rarely leans green (despite technically having green undertones). I’ve used it extensively throughout my home without every seeing a hint of green. Mindful Gray, the next next color on the color card definitely has more green to it but you should be very safe with Repose Gray. In terms of a cement-like gray on the lighter spectrum there’s Gray Owl and Stonington Gray. Stonington can lean blue if you have a lot of cool light but if your space is not well lit you should be fine. I’ve used it in all the bedrooms in my home as well as my living room and it’s perfect. If you want something a little darker (closer to a wet cement color) then Sherwin Williams Gray Matters is really nice especially when contrasted with crisp white trim or white ceilings. If you don’t have great light in that space, Gray Matters is probably as dark as I would consider going. Thanks, Jenna! Looks great. The nursery has white chair rail, so I think we’re going to use Naval on the bottom and Repose on the top. 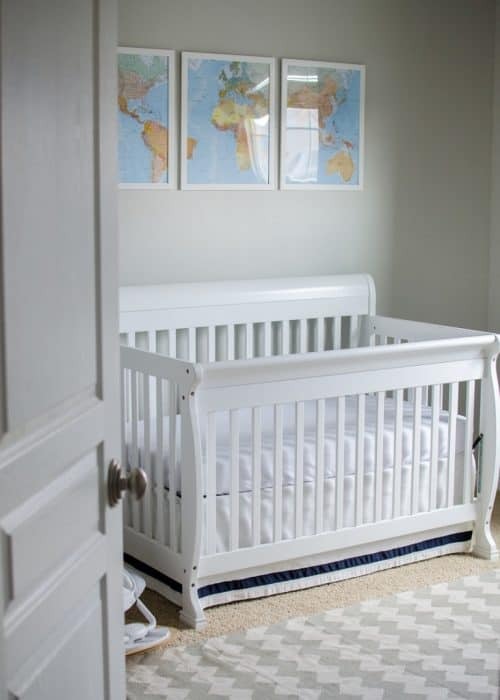 I really love those colors paired with the crisp white (like your son’s crib!) Thanks again for sharing! Yes, that looks great! Thanks, Jenna! 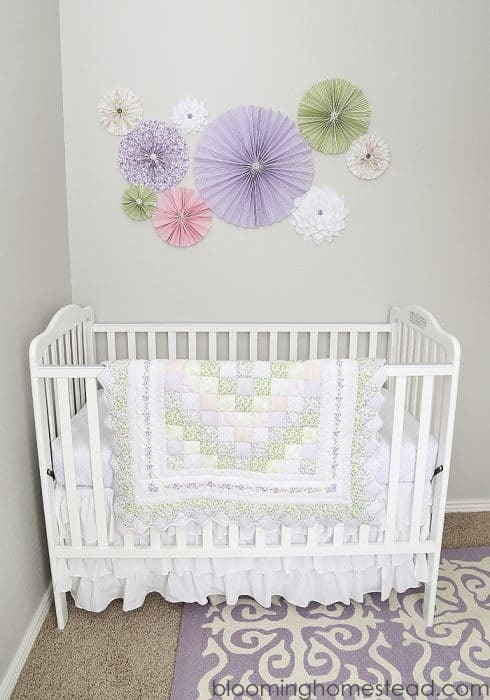 We have white chair rail in the nursery and I think we’re going to go with Naval on the bottom and Repose on the top. I love them both too with that crisp white (like your son’s crib!) Thanks so much for sending! Love your repose gray and I’m going to try your decorator white on trim in bathroom. We are in renovation process and using some carrera marble in shower. Our vanity top is a cultured marble if we use repose gray as walls we would like to make vanity darker gray as a contrast… suggestions? Hi Julie, I’ve used both SW Serious Gray (which is a dark gray but is also kinda of blue) and BM Kendall charcoal as darker contrasts and they both look amazing. Kendall Charcoal is really dark though….BM Chelsea Gray is slightly lighter and would be a great color for a vanity. I hope that helps! Hi Jenna. I love repose gray and am wanting to paint our living room, dining room, and kitchen in it. We are getting new flooring in the kitchen (a beautiful greige looking wood), but unfortunately we cannot afford to replace the carpet in the living room and dining room quite yet. The carpeting is a tan/beige shag and I am worried it will class with the repose gray. What would you suggest? It shouldn’t clash, as Repose Gray is a greige (gray with a beige undertone) so if anything it might just look a little too beige. However, with plenty of bright white trim you should be fine. Try to keep some contrast with other items in your space – beige throw pillows, beige curtains etc. and try to bring in some color where possible. I hope that helps! Am going to do Repose Gray in our living, dining, office, foyer and stairwell (all now are a creme/taupe). Our kitchen (which is off the dining room and visible from the family room) is red. I like the darker color in the kitchen but am not sure if red will go with Repose Gray. I want something with some contrast as it will essentially be the only room on the first level that is a different color. We live on the water and have lots of windows. What would you put with it? I’m not opposed to another red or maybe even a blue. Red is a notoriously difficult color to pair with anything. Going from gray to red will always be quite jarring and not flow well and may pull undesirable undertones from the gray paint (ie make it look purplish). I suggest using a blue, mushroom or even a darker gray if you’re set on a more saturated color. We have paired Repose Gray with several gray/blues including Sherwin Williams Serious Gray, Sherwin Williams Naval(navy blue) and even Behr Light French Gray – and they all look beautiful and flow well. I hope that helps. If you need any other specific paint colors I’d be glad to help! Thank you so much! Now entering the debate of repose gray or agreeable gray. Fireplace has stones that are strong in beige and cream tones. Am leaning now toward agreeable gray as it seems warmer and less stark contrast. Also, wood floors have a honey color. Your thoughts? I’m in the same boat! What did you decide on? Agreeable or repose? We went with Repose Gray and love it! In our home we used BM Decorator’s White alongside the Repose Gray. It is a beautiful clean white that’s slightly on the warmer side. It’s the perfect white without ever looking cold. Another really popular white is Simply White but I’m definitely partial to Decorator’s White and I don’t think you can go wrong with it! By the way, you can get any of the BM colors mixed at the SW store (or Lowes/Home Depot) if you just tell them the name. Good luck! Thank you so much for your response :) What color paint are your black doors? Both have beige undertones so it will be hard to avoid that if you choose either. Saying that, they are both beautiful colors! The Repose Gray has less beige than the other but definitely still has a visible undertone, especially in warm light. If you have warm light, Stonington Gray is also a great choice that’s a solid gray (but in cool light has strong blue undertones). Gray Owl works really well in the majority of spaces and has way less discernible undertones than other colors. It’s SO hard for me to tell you which color to go for. You really need to try samples. For instance, Stonington Gray is the perfect gray in my living room but literally looks baby blue in my kitchen because of the cool light. A lot of the undertone issues are light dependant. Saying that, I have repose gray everywhere in my house and it always has a beige undertone. I hope that helps – I’m sorry that I can’t tell you which one to pick!! What is the color of your doors? Hi Esme – they are painted Decorator’s White by BM. The front door is Serious Gray by SW. I have decided to paint my house..My house is 1,100 sq ft..I want a pretty clean gray…I love Seattle Gray and Repose Gray..Which one do you think it’s best? I’ve never seen Seattle Gray in person but from what I can tell it’s pretty similar to Repose Gray – both are more on the “greige” spectrum than true grays – meaning they have warm beige undertones. I think both would look equally beautiful on an exterior but I suggest buying a sample pot of each to see which you prefer before committing. I’m doing a play room and did it repose gray. I would like to add mountains but stuck on a color. I’ve thought about functional gray or Dorian gray. I like mindful gray but I’m thinking that might be to close together. But maybe it won’t. What’s your opinion? Mindful Gray is only slightly darker than Repose Gray so it depends how much of a contract you want. If want more of a “shadow” effect then Mindful would work but if you want substantially more contrast then I would go with Functional Gray as I believe it’s the darkest of the 3. Your best bet might be to grab some sample pots, paint some foam board (or something else small) and see which color works best. Colors can vary so much depending on your lighting situation! We are about to paint our livingroom and kitchen Repose gray. Just wondering if Dorian gray would be a good accent color to paint around our fireplace and under our bar area?? Both look great on the swatch together but up on our wall one looks baby blue and there other a dark gray. So torn what to do because our livingroom has tons of natural light with huge windows. Help please!! Swatches can be tricky. You’re better off purchasing sample pots and seeing what the paint looks like in your light. We used SW Serious Gray as our accent color in our living room but it definitely has blue undertones. I haven’t seen Dorian Gray in person but what I’ve seen it should look nice with the Repose Gray. Mindful Gray which is a shade darker than Repose Gray is a great accent color, too! I’m going to paint my house mostly all Repose Gray. But I’d like to paint the entry a light aqua blue sort of color. Maybe Jamestown from SW? Any recommendations would be appreciated it’s a pretty open floor plan. Also would like a different color for Master bedroom and bath but don’t know where to start!! Hi! I’m buying a home that has dorian grey cabinets. i’m not thrilled with this but oh well! :) currently the walls are this really odd yellow creamy color that really doesn’t go with the cabinets. I’d like to paint it a white that is complimentary to the dorian grey. there’s not a TON of natural light, but some and don’t want the white to look dingy. any suggestions? I know that dorian is just a little darker than the repose (which i love). Thanks! Hi! I am thinking of painting my foyer Agreeable Gray. It opens to our living room/dining room and we are thinking of painting that space Repose Gray or Tinsmith. We are struggling to figure out which to go with. It’s a big space and we aren’t very adventurous with color. I have never seen Tinsmith in real life so I can’t give you much advice there – however, Agreeable gray has nice warm undertones like the Repose Gray does so they will definitely work well together! Did you use a SW white with your repose gray in the kitchen. I’m stuck! Hi Lori – all the white in my home is BM Decorator’s White in Pearl finish. I hope that helps! what is pearl finish? How is that different from Semigloss? Benjamin Moore refer to their satin finish as a pearl finish and is usually about 25/30% gloss. It is not as glossy as a semi-gloss but closer to a satin. Hello, can I use this for both living and hallway? What would be a good accent wall color with this in a living room? Mindful gray or Dorian? Pls help. We used it in both our kitchen and hallway which are adjoining, so absolutely! Both Mindful gray and Dorian Gray are just a little bit darker so work really well without being too dark. Hello, I am planning on using repose grey in my living room/dining/kitchen but I can’t seem to find a color for my foyer/entry way! I want it to be light and airy when you walk in but since repose grey is already light I keep picking dark colors so that there is some kind of contrast! And I like cooler greys but am nervous it will clash with the beige tones in the repose grey. Do you have any ideas? We have Stonington Gray (Ben Mooore) in adjoining rooms to where we have Repose Gray and they look great together! Stonington Gray is more of a true gray than Repose Gray (which is a greige) and has some blue undertones. Another great gray is Gray Owl by Benjamin Moore. I suggest you grab a couple of samples and see what they look like in your home before you commit to any color. Good luck! What color did you paint the trim? Our trim is Decorators White by Benjamin Moore. Hello! I see your trim is Benjamin Moore. What line did you use for the trim? And what gloss? Semi? Pearl? Too many choices! I used their recommended trim paint which is water based and it goes on streaky. I only see the regal select in the pearl finish for Benjamin Moore. We’ve used regal a bunch too and it’s awesome! I will double check the canisters…I could be wrong with the pearl/aura! I’m thinking of painting our living room and hall this grey but all the pictures I see with the gray is white woodwork- we have oak with no plans to change that. Dobyoubthinkcthe gray will look ok with oak? I think because of the undertones when it’s paired with oak it will look closer to a beige than a gray. If you’re looking for a “truer” gray then Gray Owl might work well. I always recommend buying sample pots first because you never really know what it will look like until you see it in your own light! What gray did you go with? I had the same question as you! I really like that gray. It looks almost lavender in certain areas. I have to have this in my house. Hi, Jenna. Just discovered your blog today. Love it! I too LOVE repose gray and have used it in several spaces in my house. I saw where you said you used it with SW naval as well. I am contemplating combining the two for my new baby’s nursery. Would you consider sharing a photo of your space with the two colors? Thank you!! Hi Mandi! Thanks so much for your kind words! Yes, Repose Gray is awesome, right? We used Naval for the accent wall in my son’s room, the other color being BM Stonington Gray but Repose Gray would totally work, too. This is the only pictureI have right now but hopefully it will give you an idea.